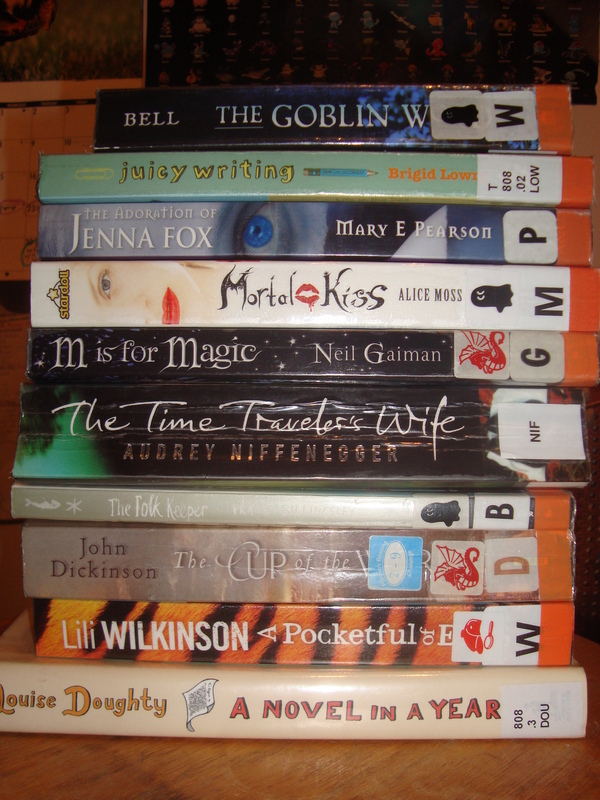 Books from Mars | An aspiring YA writer just blogging about books. Hello, fellow bookaholics. It’s Sunday, and you know what that means! 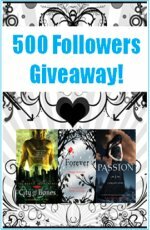 In My Mailbox is a weekly meme hosted by Kristi over at The Story Siren where bloggers showcase the books they received over the week. I haven’t been updating much, but I’ve been rather busy lately. I promise I’ll try to be better at updating. Anyways, I’ve gotten my hands on quite a lot of books this week. – Mortal Kiss by Alice Moss; With a tagline like “What would you sacrifice for a kiss?” I’m not expecting much out of this. – The Time Traveler’s Wife by Audrey Niffenegger; I guess it’s about time I read this. Everyone and their grandmother has read this. – The Folk Keeper by Franny Billingsley; After recently reading Chime by this author, I had to get my hands on her other work. – A Pocketful of Eyes by Lili Wilkinson; I’m fairly sure this is set in Melbourne. How could I resist? Deryn is a girl posing as a boy in the British Air Service, and Alek is the heir to an empire posing as a commoner. Finally together aboard the airship Leviathan, they hope to bring the war to a halt. But when disaster strikes the Leviathan‘s peacekeeping mission, they find themselves alone and hunted in enemy territory. To start off with: I hate the cover. It is such a disaster compared to the masterpiece that was the original Leviathan cover. What went wrong? If I were some random browsing the aisles of the YA section of my local bookstore, I would have shrunk back in disgust, and quickly averted my eyes, as if the horrific cover might somehow infect me. In fact, that’s exactly what happened when I did encounter this book. 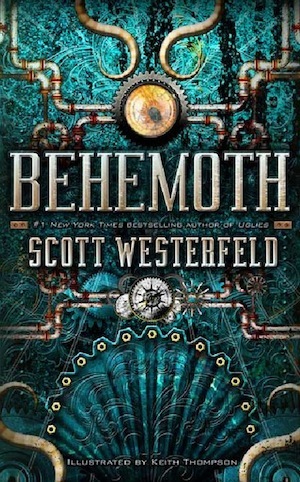 I had heard news of Behemoth‘s release, and I eagerly went forth to buy the book, which I had pictured would be similar in majesty and beauty as Leviathan had been. But no, I was met with this monstrosity. Once again, I ask, what went wrong? What were Simon Pulse thinking? I actively avoided buying this book for almost a year, until I managed to get my hands on it for $1 when a Borders was closing down. Even then, I was reluctant. Was I willing to pay $1 to have this accident of a cover sit next to my beloved copy of Leviathan? Finally, I caved in, but only because I had already borrowed it from the library and loved what was between those frightening covers. Now, cover rant aside, I loved this book. If I thought Leviathan was good, then this is just a work of art, meant to be savoured. This book deals with a lot of emotional baggage, from Deryn’s experience with her father dying a few years earlier, to her developing crush on Alek. But, poor girl, she can’t reveal her feelings to him without revealing her true identity! And with that came a fresh and delightful dose of drama. Especially when a new girl enters the picture, causing jealousy to spark from poor Deryn. The results were completely unexpected and hilarious, and I couldn’t have been more pleased at the maybe-love-triangle. And while Deryn is struggling to hide her true identity, so is Alek. He’s in a new world, filled with the enemy. At any moment, he could be found and killed. The similarities between the experiences of Alek and Deryn make this a great tool to understanding their characters and their motives. They mirrored each other in so many ways, and it was awesome reading about their characters. The plot is just as exciting as it was in Leviathan, with explosions starting right off the bat (if you’re into that sort of thing). And after that, there’s non-stop action and suspense all throughout the book, making it literally impossible to put down. I sat with Behemoth in my hands for four hours, braving a grumbling tummy and neglected housework. It will leave you completely hooked and wanting more. The writing is amazing, but, it still uses the annoying over-used vocabulary like bum-rag and such. Thankfully, the descriptions make up for it. Everything was described so vividly that it was really easy to imagine what was happening, and what everything looked like. This is especially amazing in the completely new setting of Turkey, where everything feels surreal, exotic and wild. 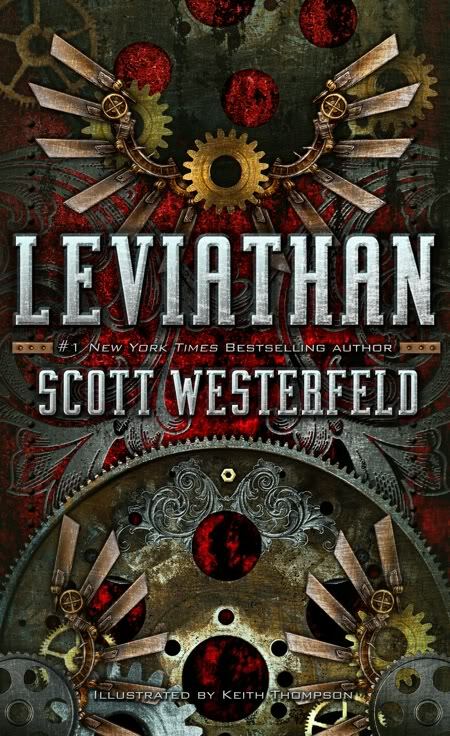 The city actually felt like a whole new character, just like how the Leviathan felt like a character in the first book. For that, I applaud Westerfeld. It’s hard to pull off a setting like that, and to make it feel like a living, breathing characters with its own flaws and characteristics. And, lastly, I have to give an honorable mention to Keith Thompson, whose artworks also feature in this book. Once again, they have left me speechless with their precise beauty. They certainly add depth to an already fantastic book. I’m eagerly awaiting Goliath, but, unless they go back to the original covers, I probably won’t buy it. The cover just looks bad. I’m very picky with my covers, as you can see. But August can’t come soon enough. Well, it’s that time of the week again, fellow bookaholics! Yep, it’s Sunday, which means it’s time for In My Mailbox. 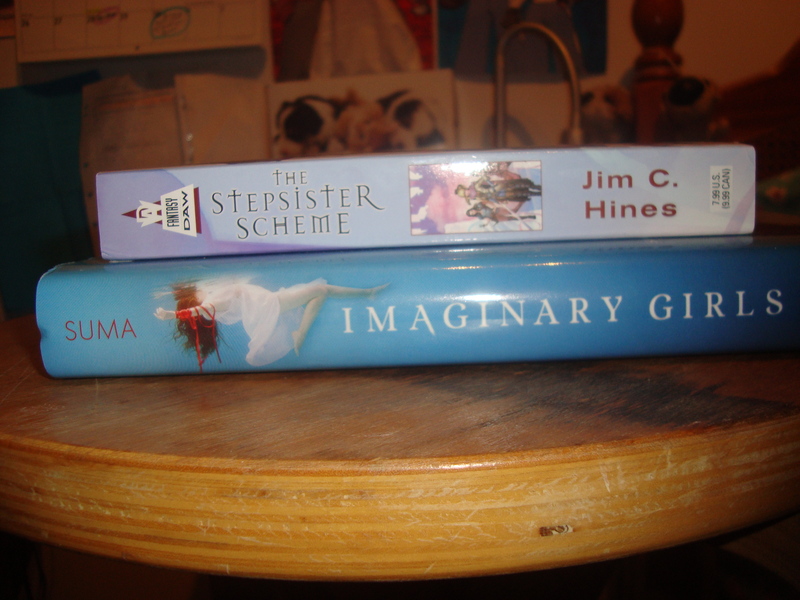 In My Mailbox is a weekly meme hosted by Kristi over at The Story Siren where bloggers showcase the books they received over the week. 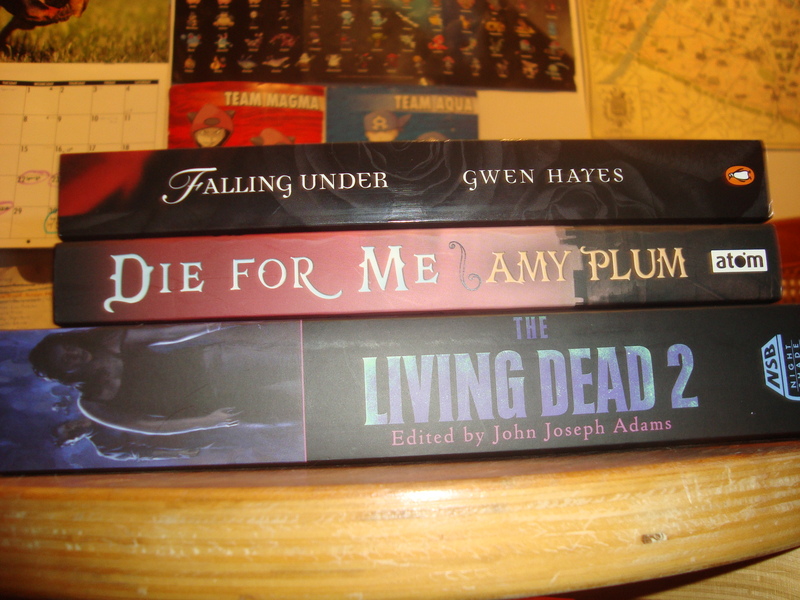 I got quite a few books this week. A few from an Angus and Robertson that had a super amazing sale (so amazing that I bought 4 books for just $18! *swoons*) (here in Australia, A&R are owned by the same company that owns Borders, and since Borders is completely shutting down here in Aus–yep! you heard that right! 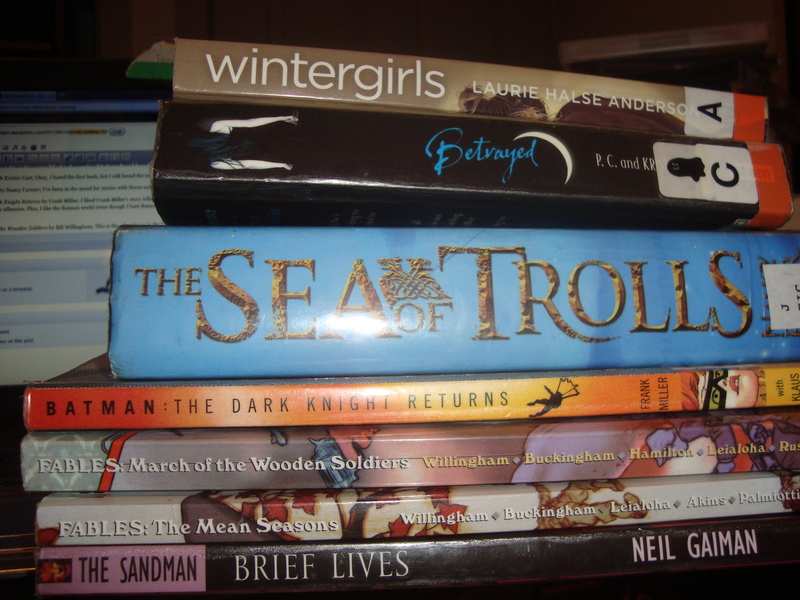 *sobs*– A&R are having sales as well), and quite a few from The Book Depository, and finally, several from my library. – Magic or Madness by Justine Larbalestier; I got this from A&R for just $5! Justine is an Aussie author, so I’m excited to read it and showcase it here. 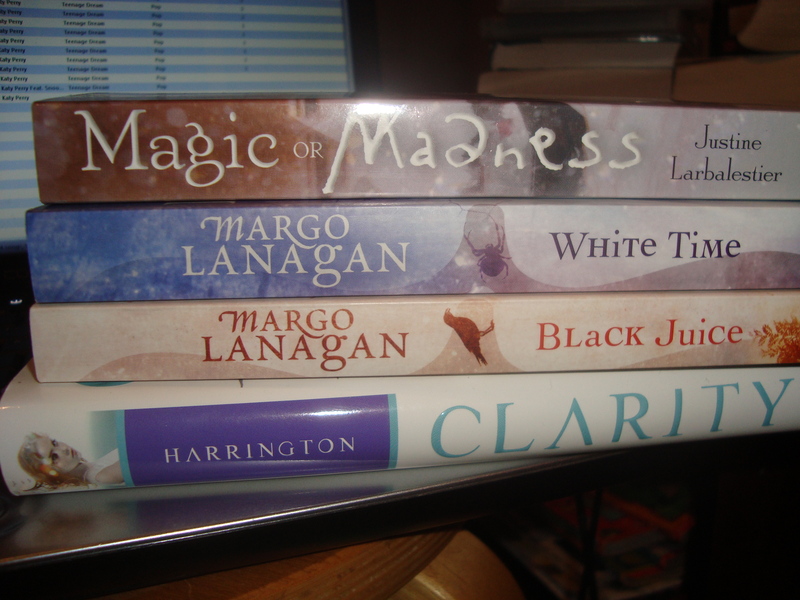 – White Time by Margo Lanagan; I’d heard many things about Margo Lanagan’s work, both good and bad–the bad is mainly how Lanagan doesn’t shy away from hard issues, which I think is a good thing–and I’m excited to read it. I got it from A&R for $5. 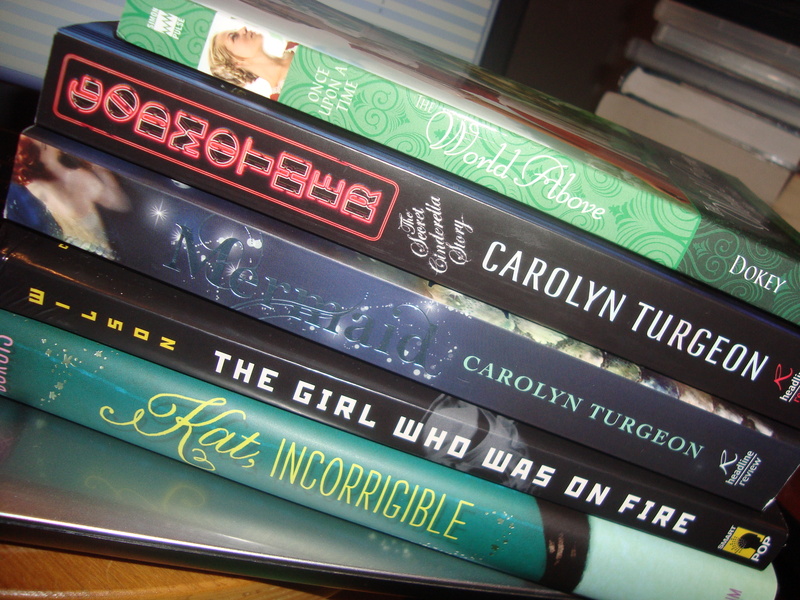 The following books were obtained from The Book Depository. – Godmother: The Secret Cinderella Society by Carolyn Turgeon; The premise of this book sounds so fun! And it’s about fairy tales! I love fairytales! – Mermaid by Carolyn Turgeon; I hadn’t realised that I got two books from the same author, I only got this because it has mermaids! I love mermaids! – The Girl Who Was on Fire edited by Leah Wilson; I love The Hunger Games and I love essays on modern works. So how could I resist this? – Kat, Incorrigible by Stephanie Burgis; I’ve been hearing such fantastic things about this book everywhere, so I knew that I would have to get it. Plus, the cover is so cute and awesome! I hope to review this soon. – Wintergirls by Laurie Halse Anderson; Can you believe that I’ve never read a book by Anderson? I really should start now. – Betrayed by P.C. & Kristin Cast; Okay, I hated the first book, but I still found the urge to read the next book in the series. I’m a masochist. – The Sea of Trolls by Nancy Farmer; I’ve been in the mood for stories with Norse mythology in them and found this. Hopefully, it’s good. – Batman: The Dark Knight Returns by Frank Miller; I liked Frank Miller’s story-telling technique in Sin City, even though the views on women are sometimes fairly offensive. Plus, I like the Batman world (even though I hate Batman. He has no super powers therefore isn’t a real superhero, IMO). – Fables: March of the Wooden Soldiers by Bill Willingham; This is the 4th volume in the Fables series. I loved the first 3, and really can’t wait to read this one. 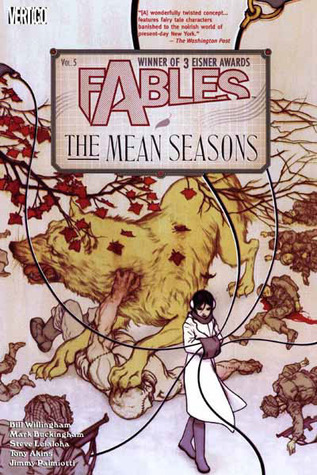 – Fables: The Mean Seasons by Bill Willingham; I’ve been in a very graphic novel sort of mood lately. This is the 5th volume in the Fables series. 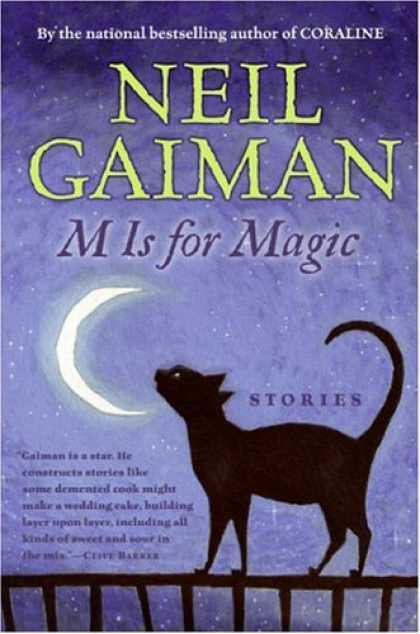 – The Sandman: Brief Lives by Neil Gaiman; I love love love the Sandman series. This is the 7th volume. I really can’t wait to get into this. So, that’s what I got in my mailbox this week. What did you get this week? Feel free to leave a link in the comments. I’ll admit, I was rather skeptical about this book at first. I thought it’d be another stupid angel romance story with next to no plot and an abusive, angelic love interest, and a main character who was TSTL (too stupid to live). Boy, was I wrong. Not only are angels not romanticized here, they’re actually the enemies, who steal something special from their victim, leaving them sick and helpless–a shell. There isn’t some long, drawn out and overused religious lore behind them, they just are. They aren’t God’s messengers. They aren’t heaven-sent. They aren’t the angels you’d expect. They became the perfect enemy, taking over the human world, leaving their imprint and making people of faith put all their trust to them, only to exploit them by feeding off them. What I loved most was that they founded a religion devoted to their worship, making people love them and trust them; it was a nice, ironic touch, and I loved it immensely. Willow is different from other main characters that I’ve encountered. Right off the bat, we see how strong she is as a character, and she keeps getting stronger. She’s smart, cautious, real. And the way she cares for her mum, it makes me appreciate her more, because, for once, here is a YA main character who doesn’t ignore others for her love interest, especially her family. I love how she gets frustrated with her mother sometimes, because despite doing her best to help her, her mother is too far gone to do anything. Her frustration at her mother’s vegetative state is selfish, honest, real. At first, I thought the psychic thing would be used to make Willow ‘speshul’, but she actually uses it properly, which is something I applaud. For example, when she see’s Beth’s choices, and what happened to her, she handles it maturely forthe situation and her character, and tries to help Beth as best as she can, even though she knows that it would be futile. I loved the interaction between Willow and Alex. They had this chemistry together, and it was done really well. They were awkward towards each other, ad avoided interacting with each other because of who they were–Willow, the human/angel hybrid freak, and Alex, the protector of humans and killer of angels–and it brought a whole new meaning to the whole “I love you but I want to kill you” thing that’s so popular in YA romances these days. Alex actually has justification to try to kill Willow at the beginning of the book. He thought she was on the angel’s side, being half angel and what not. All his life, he had been taught that angels are evil creatures, and yet, he found himself stuck with a girl who was seemingly half evil. The way he reacted to her then was fantastic and real. After a few days of knowing him, Willow tells us that she’s fallen in love with Alex. While this sort of insta-love usually bothers me, I’m willing to accept this, since they’d literally been stuck together for the last few days, getting to know each other and bond. And, oh how they bonded! Their chemistry was beyond delicious! It was addictive, and I wanted more of their shy flirting, of their awkwardness, everything. Once they manage to finally declare their love, though, they turn into love-sick tweens, acting all cutesy and saying stuff like “I’d die without you”, and it’s enough to make anyone gag. It was a bit of a downer, after such a fantastic build-up. I think I’d rather stick with the teasing sexual tension than deal with twu wuv~! that feels forced and annoying. One of my main concerns with the book was the writing. It is narrated sometimes in third person, from the POVs of various characters, including the baddies, and sometimes it’s narrated in first person from the POC of Willow. I think that this is the only fault in the otherwise spectacular and gripping writing, but it wasn’t enough for me to drop the book–which I totally would have if it weren’t so OMG-worthy. The writing made it so impossible to put down, it was so action-packed. It will constantly keep you guessing. This is a book that I would recommend for everyone. It isn’t your typical paranormal novel. It has a well thought out background, a gripping plot and plenty of action. Read it immediately.